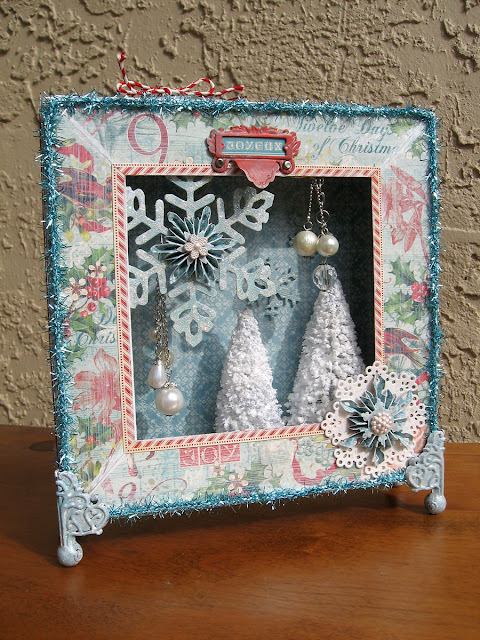 Annette's Creative Journey: A Frosty Florida Winter? Hello and happy Friday! I'm featured over on the Graphic 45 blog today sharing the spotlight with the talented Miranda Edney as we both share two completely different ideas using the 8 x 8 Graphic 45 Matchbox. While Miranda designed an amazing Steampunk Spells menagerie, I created a snowy, frosty Christmas display using the 12 Days of Christmas. You're sure to get some great inspiration today. Here's a peek at my project. Be sure to hop over to Graphic 45 where I share how I made it. Leave a comment, if you please, once you've visited Graphic 45 to let me know what you think. Enjoy your day and the weekend! I'll be back on Monday. Gorgeous Annette! I also wanted to tell you how much I enjoyed your virtual open house! Great projects. Got lots of ideas brewing in my head now. This is soooo pretty! I love that the die cuts and the baubles make it very elegant! Coffee a great drink to hang out during the summer seasons. Gorgeous! Wow!!! I really love it.